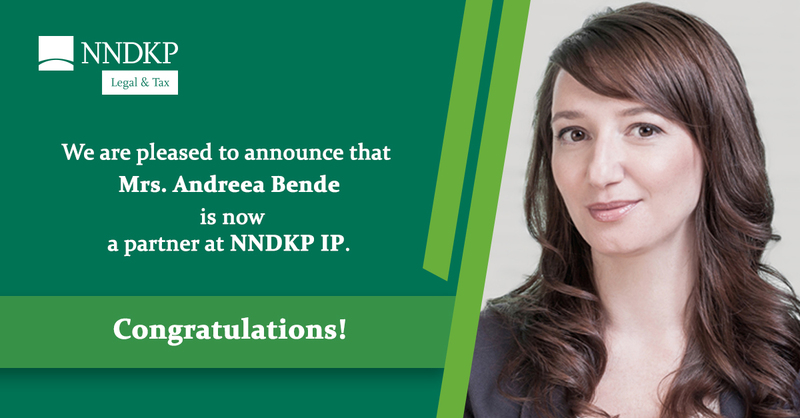 “Andreea’s promotion to Partner in the NNDKP IP was a natural decision that embodies the confirmation of her talent and skills as a top professional. I am proud of our journey together and I congratulate Andreea for this well-deserved recognition of her current and future role in the firm. I wish her all the best and I am confident that she will continue to bring her contribution with the same passion and involvement that she showed on the first day she set foot in the NNDKP office”, stated Ana-Maria Baciu, Partener and head of NNDKP IP. NNDKP’s intellectual property arm (NNDKP IP) was established in 2003 and today is the most frequently awarded and highest ranked team in the Romanian jurisdiction by specialized IP research guides. For example, NNDKP IP received the IP Law firm of the Year in Romania award at the MIP Gala in 2014, 2015,2016, 2017 and 2018 (the only firm in Romania to have been awarded this distinction five times).